It’s been a whirlwind first year in my new barn studio. Since January 2014 I’ve held one to two craft workshops a month. I’ve spent many days crafting and blogging with much more efficiency and joy now that all my materials and supplies are organized and accessible. I have enjoyed hour upon hour of shopping for bins, cans, boxes, and various other unique containers to house my crafty goods, an exercise I enjoy every bit as much as crafting. I adore vintage pieces and especially those with early advertising typography and graphics, so the hunt become my entertainment many evenings- while others may be watching TV or doing their homework, you are likely to find me with my laptop flipping back and forth from Etsy to eBay to Craigslist. I’m extremely frugal, so patience is a virtue when shopping online. 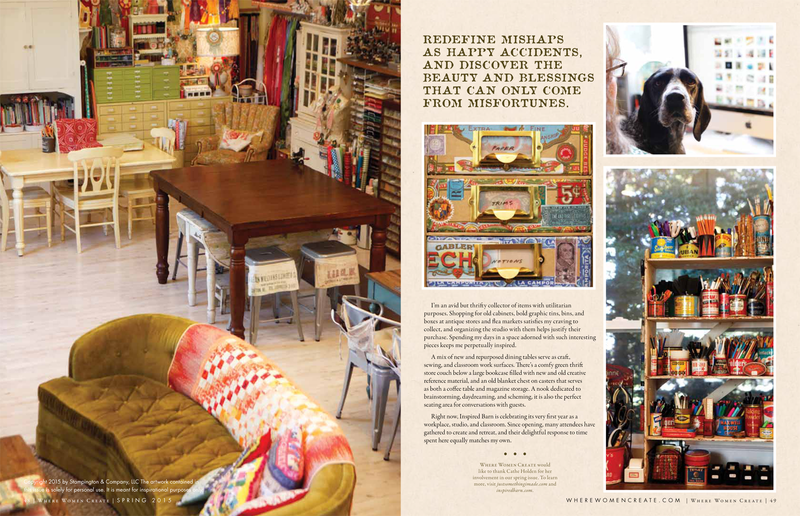 Local thrift stores, flea markets and our local landfill’s recycle area have proven great sources for unique pieces. 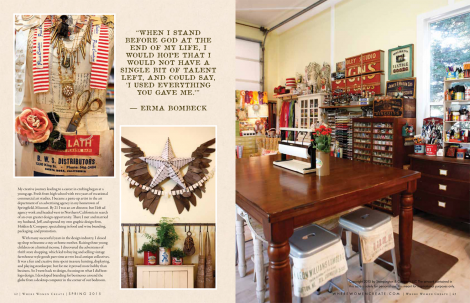 Inspired Barn has become a consistent place of creative flow from organizing to decorating to crafting. Special thanks to Paige Hill, a kind supporter of crafty ones and who first introduced me to Jo Packam– the amazing, dynamo of a woman behind this inspiring magazine and one who continues to give considerable support to creative industry professionals. Thank you to my friends who name-dropped me until I could no longer be ignored by WWC, as well as the talented women who work hard to make this magazine so special- Eileen Hull, Brandy Shay, and Cynthia Levens, to name only a few. 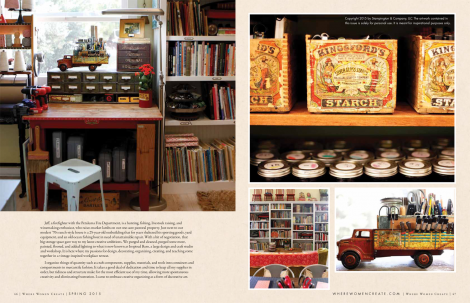 And thank you Jenny Elwick, for through your eyes, heart, and camera lens, my studio shines. 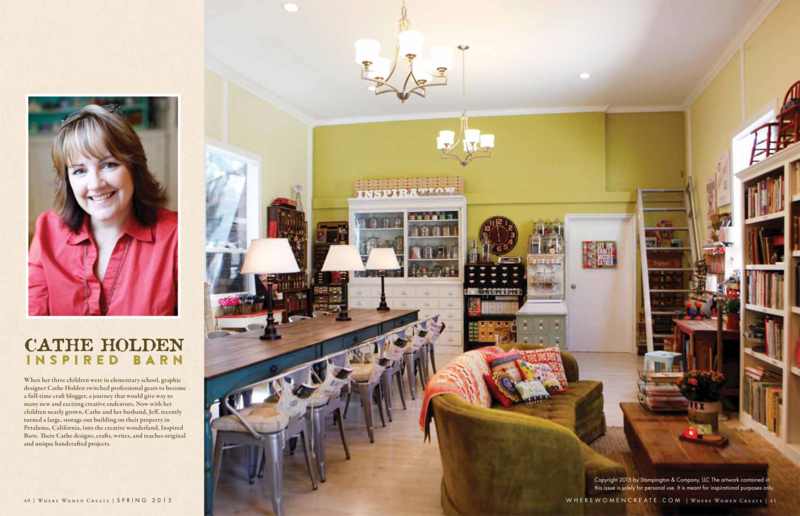 This entry was posted in Inspired Barn, studio, Uncategorized and tagged Inspired Barn, Where Women Create. Bookmark the permalink. How wonderful, Cathe! I bought the magazine a few days ago. Your barn is so beautiful. WWC is one of my favorite magazines; I always find inspiration there even though my studio is actually a spare bedroom. 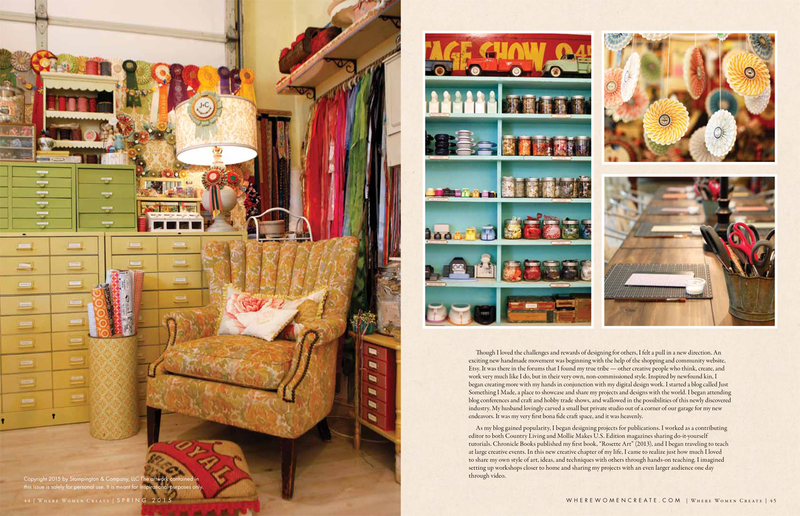 It’s special, though, because it contains my favorite stuff and space, precious space, to spread out! I was just reading that issue the other day and drooling over your space. It really is super inspirational. 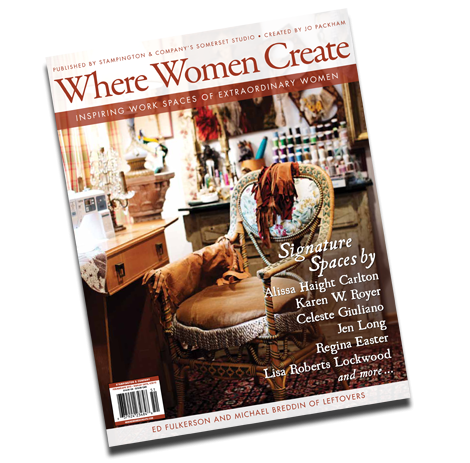 Congrats on Where Woman Create! I am so glad you are being showcased in all those magazines. With all your hard work and all you share with everyone you deserve the honors. i have a large stash of yarn which I need an interesting idea of how to store it. We are buying a house with a room I can’t wholly dedicate to my crafting but want something where I can see what I have but out of reach of the baby, dog and especially cat! Lol. 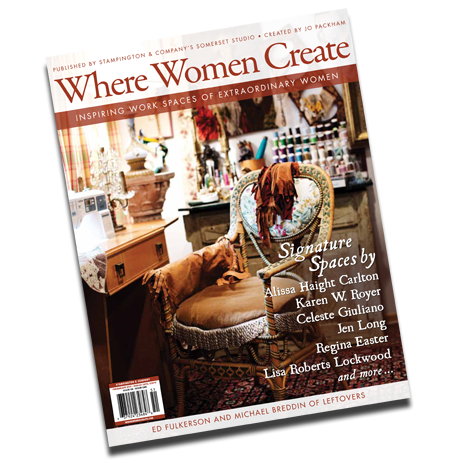 Hi Cathe, I picked up my first ever copy of Where Women Create and I have to say, I was drawn to your space. I love everything about it! Awww Cathe, I just found this! So nice of you to include me in your post :[) Hope all is going well for you? I don’t know if you remember me, but I wrote you several months back. I had stated that our daughter Justine had just moved to beautiful Petaluma for a job transfer, she was just getting moved in when I wrote to you. Well she is now settled and I am loving coming to visit her on occasions when I can escape my chores at home! At the time I stated that when I am in Petaluma, if you would like to join me for a cup of coffee, I would really enjoy meeting you. I am a local crafter who networks with local women to create in our community! You stated that we could come out to your barn. I will be in Petaluma on May 7-12, or 13. Do you have anytime then to meet around those dates? I look forward to your response. I thank you for your time. You must be in 7th heaven having all that space, and all your stuff organized! Best of luck with success!